When it was first released in 1968 at the height of the pop psychedelic era, the Beatles’ animated feature Yellow Submarine was immediately hailed by audiences and critics alike as another Fab Four masterpiece. Saturated with the group’s trademark humour and personality and propelled by classic Beatles songs, including the title Lennon-McCartney song as well as “Eleanor Rigby,” “WhenI’m Sixty-Four” and “Lucy in the Sky With Diamonds”, Yellow Submarine was, and is, a pioneering, surreal and visually stunning animated feature. Outdoor screening as part of Anim18 with special food & drink offers including bespoke ‘Blue Meanie’ ice creams, the Sunshine Pizza Oven and more. There will be refreshments on site. Please note this is an outdoor screening (seats available) on the Canal Basin area of Victoria Quays. Please wrap up warm and feel free to bring blankets. Victoria Quays is cobbled and uneven in places so please wear flat, sensible footwear. This is a waterfront location, please aware of the water’s edge. Under 16 year olds should be accompanied by a responsible adult. Note – Yellow Submarine contains some psychedelic scenes that some viewers with visual or sensory sensitivities may find disorienting. 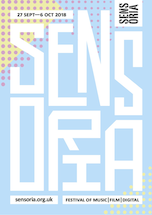 Get discounted car parking at Sensoria 2018 – suggested car park QPark Castlegate.